This feature is useful when you need to revert your schedule, in-case of mistakes. 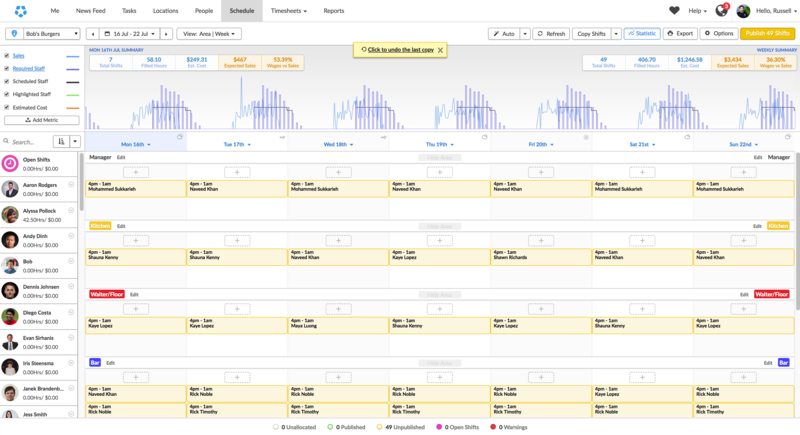 The Undo feature in scheduling allows you to revert changes made. Please note that this only appears when making bulk updates to the scheduling page, such as loading shift templates, auto-fill empty shifts, or cloning empty shifts. The undo button will not appear when creating single shifts. After making a bulk update, a small yellow prompt will appear at the top of the schedule page. In this example, we've loaded in a shift template, and filled it in using our 'Auto-Fill Empty Shifts' feature. At the top, you will notice the undo prompt. Clicking this will perform an undo of the previous actioned copy, as seen below.